The beagle is one of the most popular and recognizable dog breeds. Beagles are energetic, carefree, and optimistic dogs but they can have a stubborn streak. The beagle is an ideal breed for active households. The comical and even-tempered demeanor of this breed makes it a great choice for families with children, but remember that not all dogs get along with kids, regardless of breed. You should know that beagles are known for their tendency to vocalize, especially with their signature "bay," which is much like a howl. Some beagles vocalize out of boredom, but many bay just because they want to, no matter how much activity they get. Size: All beagles should be no more than 15 inches in height at the shoulder, with two varieties of those under 13 inches and those from 13 to 15 inches. They weigh 20 to 25 pounds. Beagles can be traced back to 16th century England, where Englishmen often owned packs of hounds. The smaller hounds were the beagles, which were used in hunting rabbits and other small prey. They were also used as gun dogs, flushing game for hunters. Over time, the breed was developed in England and later in North America. Beagles became more refined and widely recognized in North America by the late 19th century, eventually becoming one of the most popular breeds. 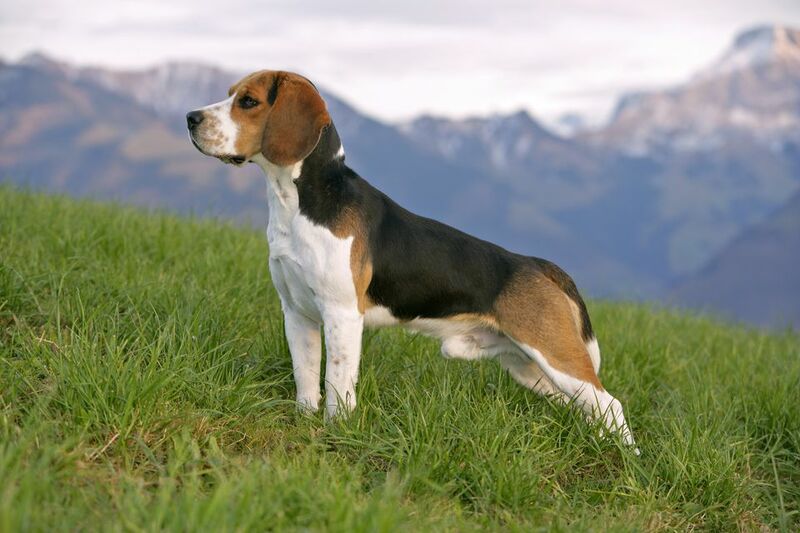 Though still used in packs for hunting today, beagles are commonly seen as wonderful companions and family dogs. The breed was recognized by the American Kennel Club (AKC) in 1885. Beagles are scent hounds, tracking their prey by ground-scenting. Their keen sense of smell ranks with bloodhounds and basset hounds. They are used by the United States Department of Agriculture for detecting contraband food items in luggage. Snoopy from the "Peanuts" cartoon is a beagle, reflecting the breed's popularity at the time Charles Schulz began to draw the comic strip in 1950. President Lyndon Baines Johnson owned several beagles while in the White House. Beagles have short, water-resistant coats with a moderate to high rate of shedding. Routine basic grooming is all that is typically necessary to keep beagles looking their best. Luckily, their coat doesn't pick up much debris, so you won't need frequent baths or cleaning up what your dog tracks into the house. Be sure to keep their floppy ears clean to prevent ear infections. Also, remember to trim your dog's nails regularly to prevent overgrowth, which can affect the gait. It is also good to brush your dog's teeth at least a couple of times per week to maintain good oral health. Though they may sometimes act lazy on the surface, beagles have loads of energy and need regular exercise to use up that energy. Otherwise, the buildup of energy may release that mischievous nature inside. Walk your dog once or twice daily and give him plenty of chances chance to run and play every day. As scent hounds, they enjoy sniffing everything along your walks and this will exercise your dog's mind as well as his body. But you will need good leash control and training so you can control your dog if he gets a scent that he wants to track. As they get along well with other dogs, free running in a properly enclosed dog park can fun for both of you. A yard with a physical fence is preferred to one with an electronic fence as a beagle may not stop once he catches the scent of interesting prey. Be sure your dog has an identification collar or microchip as they can be escape artists, digging under fences and finding other ways to escape. These fearless hounds are well-suited to both hunting and companionship, but proper obedience training is an absolute necessity. Without it, beagles can be become unruly and defiant due to their strong-willed nature. They are notoriously difficult to train and command and you have to make it fun and interesting for your dog to pay attention to your wishes. Beagles can be wonderful companions and great family dogs when properly trained and socialized. Having been bred to be in packs, they get along well with other dogs and most do well with cats, especially if raised together. They are excellent with children as long as the child is old enough to treat a dog with respect and to tolerate the high energy the beagle may display. Also note that these dogs are considered to be mouthy, so they may mouth a child's arm to play, and this might frighten a child. A big consideration in having a beagle is their barking and baying. They will bay when they detect an interesting scent but they may also become problem barkers due to boredom or separation anxiety. Beagles need human companionship or the companionship of other pets throughout the day. Beagles love to eat and are notorious for detecting, raiding, and eating anything they can. You should provide two meals a day of up to 3/4 cup of dry dog food per meal. The amount will vary by the dog's size, age, activity level, and other factors. Keep the dog food and your human food well-secured against this thief. Because of their omnivorous appetites, you will have to monitor your dog's weight and take action when you see he is becoming overweight. Discuss your dog's needs with your veterinarian to get recommendations for the right food, feeding schedule, and amount. If you think the beagle is right for you, be sure to do plenty of research before you get one. Talk to other beagle owners, reputable breeders, and rescue groups to learn more. Explore the many dog breeds out there. With a little research, you can find the right one to bring home. Is a Westie the Right Dog for You?